I remember when I started running 8 years ago, and it was painful, and it took my time to get my wind up, my stamina, my stride well, and it took awhile before I actually felt like a runner and I ran some races. I got through the awkward, the painful, and made myself an athlete at 42, after kids and cancer and 2 autism diagnosis. Running I am pretty much saved my sanity. 2 years ago after my son was injured at school, I went dark, I stopped, just stopped. I ran a half marathon 2 days after his injury and haven't run since. In these 2 years, I gained weight, went a little crazy, had a little PTSD, and seriously injured kid to care for, and a lot of tears to shed. Well we have all turned the corner, he is finally on a road to a better place, I am ready to get out of this sick mind, and chubby body and get my MOJO and my happy back. As an autism mom, I am the first to neglect myself, and care for everyone else and what they need and want until I'm exhausted enough to not do anything for myself. Well I'm changing that today. I realized that caring for my kids, especially as they get older, bigger, stronger. I need to get healthier because I am all they have. I learned a lot of lessons, there is not anyone that cares what happens to them. We don't have anyone that would step up if something was to happen to them. So my self-care will be guilt free (maybe) and not selfish. It's just like if I needed to take a chemo infusion if I had cancer - I NEED IT, THEY NEED IT. My care is essential to their care. 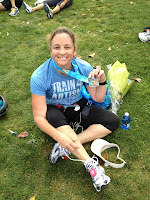 So I am not sure where I'm running to if I'm going to train for a race, for now it's just more of a therapeutic thing. I have to lose the awkward, get back in runners shape, lose the summer 20 I put on, and figure out if I'm going to do a race, or just I don't know, I just don't know.